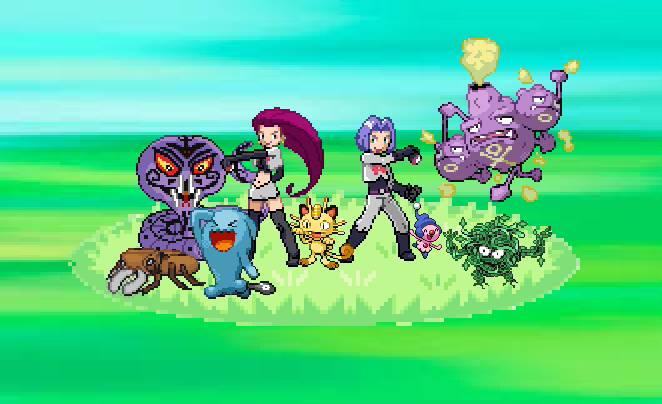 The following page is a list of the main characters of Cosmic Quest, along with detailed descriptions of all of their Pokémon. Be warned, this page may contain spoilers. Ash is a ten-year-old boy from Pallet Town in the Kanto Region. It’s his goal to become a Pokémon Master. Along with his partner, Pikachu, Ash travels around the world battling various Gyms. Pikachu was Ash’s first Pokémon. Their relationship was a little rough at first, Pikachu would constantly shock Ash with its Electric-Type attacks. They eventually became inseparable friends. Team Rocket believes Pikachu to be stronger than the average Pokémon, so it is constantly the target of their attacks. Obtained in Episode: Pokémon – I Choose You! Ash first met Eagladiator in Aster Town, when it was an Apprentichick. It had a habit of challenging any Pokémon it met to a battle, and if it was about to lose, it would run. Ash eventually found out that it was attempting to train to get into an exclusive flock of bird Pokémon. After it helped Ash defeat Team Rocket, Ash offered to train it to make it stronger. It Evolved into Falcoknight the middle of an aerial battle at the Atmos Gym. Then it evolved again when having its rematch with the leader of the flock. It is a tough Pokémon, willing to take on any challenge. Tursol, back when it was a Turcell, was one of the three starter Pokémon given to new trainers in the Tenno Region. Ash first met this one when he saved it from a river after it ran away from Cosmo. Turtsol took a liking to Ash and began to follow him around until Ash eventually obtained it as his own. Turtsol is a very curious and energetic Pokémon. It loves to bask in the sunlight. Ash met this Pokémon when it interrupted a training session of his. It was an outcast from a group of shy Dashilisk. Unlike its friends, this Pokémon is very outgoing and loves to have a good time. It will often break out in a happy dance for no real reason. It also has a very quirky personality, leading it to be an oddball Pokémon. It is also a quick learner, having mastered Ash’s strategy to beat the Atmos City Gym after watching it only once. While in the Park Zone, Ash met a Traineed who would stand up against opponents several times its own size due to its strong sense of justice. Ash and Falcoknight helped it train to become stronger and achieve its goals. It then evolved during a battle with Team Rocket into a Arborrior. While it may be powerful, it has not reached it full potential, and therefore its goals have still not been met, so it decided to travel with Ash so that it can continue to train with him. It has a strong bond with Eagladiator. The two are often training/sparring partners for each other. Ash first encountered Heala when he witnessed Ryu attempting to catch it. While it first seemed eager for battle, as soon as Ryu declared his first attack, it fled. Ash learned that the Heala had a great love for battling, but was too afraid to battle itself, no matter how much it wanted to. The two became friends when Heala helped to heal Brenda’s Kappaqueous. It then decided to follow Ash, so that it may watch him battle. After a while of doing this in secret, Ash discovered that Heala had been doing, and offered to help it better enjoy battles, both watching and participating. Heala is a powerful battler, but is extremely jittery in battle. It tends to be very curious as well, and will often stumble into trouble. Brenda is a brand-new Pokémon trainer. She comes from Launch Town in the Tenno Region. She has a love for adventure, and dreams of traveling into space. Despite having never heard of a Pokémon Contest, she decided early on in her journey that she wanted to become a coordinator. She shows much natural talent, but also has a tendency to rely too much on such talent and not train. Kappaqueous was Brenda’s first Pokémon. They first met at Professor Pine’s lab when it was just a Kappaqua. It wasn’t long until Team Planetary attacked the lab, attempting to steal a starter Pokémon. In the resulting chaos, Kappaqueous ran away. Brenda chased after it and eventually found it dangling over a cliff. 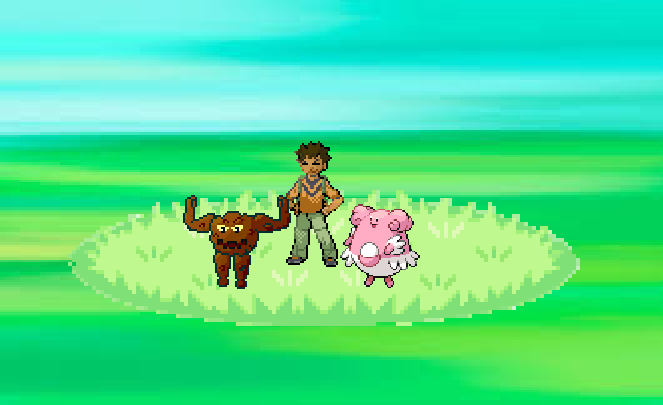 After rescuing it, Brenda and Kappaqueous were then chased by a swarm of Beedrill. Kappaqueous fought them off to protect Brenda. After that, they developed a strong friendship. Brenda caught Glitterfly as a Glowva while in the Sol Forest. It evolved into Chrysalux soon after, and then a Glitterfly. It is a strong battler and shows off its elegant beauty well, making it great at Contests. Rabbolt is both sweet and rowdy at the same time. Brenda first encountered it on her way to Atmos City. It quickly showed a tendency to mess with Pikachu, apparently not liking it. Rabbolt will actually act this way towards any Pokemon that looks similar to it. It is a skilled battler that can make precise movements. Caught in episode: It Keeps Going, Going, Gone! Brenda first met this Pokémon when she was depressed about losing her first double performance contest. She was lost in a cave and too busy pitying herself to know what to do. Frostcicle not only showed her a way out, but made sure she felt better too. Frostcicle is a fun-loving Pokémon that always wants to make sure everyone has a smile on their face. In order to help cheer people up, it knows several dazzling displays, which Brenda uses for contests as well. When Brenda first met Wispirit, it was in the middle of supposedly haunted woods, and she thought it was a ghost. Wispirit has a mischievous nature and is always looking to spook people, especially Brenda and have fun at other’s expense. It can control effortlessly control fire and creates massive illusions of fire as well. At some point in the future, Brenda’s Kappaqueous will evolve into Kappaquarious. In its age, it has mastered in psychic control over water. Another Pokémon that Brenda will obtain at some point before twenty years in the future. It seems to be a powerful battler. Brock originally was the Gym Leader at the Pewter Gym in Kanto. He left to travel with Ash in order to train to become a Pokémon Breeder. After traveling with Ash through the Kanto, Johto, Hoenn, and Sinnoh Regions, Brock decided that his true calling was to become a Pokémon Doctor. Now he’s achieved that goal and travels around the Tenno Region, giving assistance to various Pokémon Centers. Brock originally obtained Blissey as a Happiny Egg in Sinnoh. For such a small Pokémon, it showed great strength, lifting things many times its own body weight. The day Brock decided to become a Pokémon Doctor, Happiny evolved into a Chansey. It then evolved again some time during Brock’s training to become a doctor. 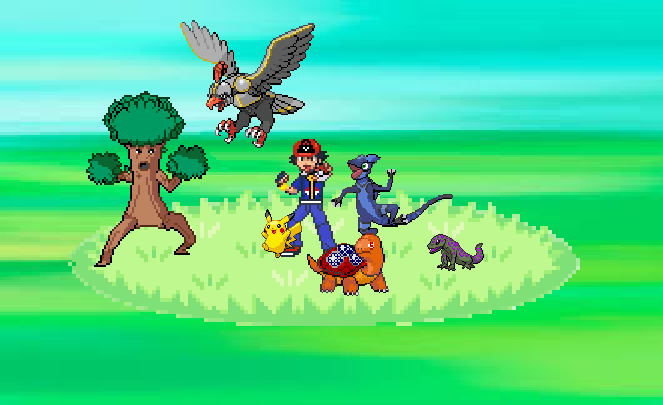 Brock met Meteorfight soon after it crash landed on Earth from outer space. He had to calm it down and help it adapt to living on Earth. It knows many powerful moves, and has a habit of uppercutting Brock. Jessie is a member of Team Rocket. Along with her partner James and a talking Meowth, they chase after Ash and his friends in a futile effort to catch Pikachu and other Pokémon. Jessie is known for her vanity. If it has to do with fame, she’s all over it. She also competes in Pokemon Contests, normally under disguise. Jessie originally got Wobbuffet by accident, unknowingly trading her Lickitung for it. It serves as an annoyance, popping out of its Pokéball when it isn’t needed. While it may not know any offensive moves, its defensive ones can be powerful force. Repiv was originally Jessie’s Ekans, and then later Arbok. She originally received it as a Birthday present. For a long time it was her main Pokémon until she released it somewhere in Hoenn so it could help a group of Ekans and Koffing. Some time later, it evolved and then went to Team Rocket HQ an an attempt to find Jessie. First appeared in: Pokémon Emergency! Evolved into Arbok in: Dig those Diglett! Buzzsaw was first seen when it scared Brenda. Upon seeing how Brenda reacted to it, Jessie decided to capture it in order to distract her. Buzzsaw is a very easygoing Pokémon and goes along with almost anything Jessie suggests. Despite this, Buzzsaw is also a very powerful battler, managing to hold its own even against Pikachu. Even though Brenda got over her fear of Buzzsaw, she still can’t help but get startled when seeing it. Caught in Episode: Stop Bugging Me! James is another member of Team Rocket. His partners are Jessie and a talking Meowth. James, for a Team Rocket member, is actually very kind and caring. He always thinks of his Pokémon first. He often has problems with over-affectionate Pokémon. Haking was originally James’ Koffing and later Weezing, which he obtained as a Christmas gift. It was his main Pokémon for a long time. He eventually released it so it could help a group of Ekans and Koffing. Some time later, it evolved and went to seek out James, looking at the Team Rocket HQ. Evolved into Weezing in: Dig those Diglett! James first met this Pokémon when it stole food from Team Rocket. After a mishap while chasing it down, the two had to work together. They quickly became friends. Ivine is often hungry and has a rather aloof personality. If it touches anyone they’ll instantly become itchy, which is an annoyance to James, as Ivine has a habbit of hugging him. Cosmo was hand selected by the leader of Team Planetary to be his successor and is currently training to do so. He first met Ash when he stole Professor Pine’s Sporout meant for new trainers. Ash quickly grew to dislike him, and made it his personal mission to stop Cosmo. Cosmo, on the other hand, sees Ash as nothing more than an annoyance. Cosmo seems to truly believe that everything he does is for the good of Tenno. Ferntress was the Sporout that Cosmo stole from Professor Pine. It’s strength combined with Cosmo’s natural leadership make it a formidable foe. Despite the fact that Cosmo stole it, it seems to have developed a bond with him. It has very powerful defensive capabilities. Evolved into Buffern prior to: The Rival of my Rival!? Ryu is a tough trainer who only trains Dragon-Type Pokémon. He sees all other Pokémon types as inferior. He is normally grumpy and/or emotionless, but will show emotion towards his Dragon Pokémon, especially his Dragonair. He is currently traveling the Tenno Region with the intent of gathering Gym Badges, and aspires to become a Dragon Master. Dragonair was Ryu’s first Pokémon. As a Dratini it saved him from a pack of wild Granbull when he was young, and they were friends ever since. Despite its diminutive size, it is a fierce and powerful battler, able to hold its own against Ash’s Pikachu and survive longer than any other of Ryu’s Pokémon against Galileo’s Dracosmic. It knows a wide variety of moves, ranging from Thunderbolt, to Dragon Dance, to Aqua Tail. Ryu traveled into the Crater Gate with the one goal of catching a Galacerta, and he did. It is an agile battler, with a wide range of movement. With a range of moves such as Light Screen and Dragon Tail, it can play offensive or defensive depending on the situation. It later Evolved. Ryu’s Gabite, originally a Gible, was one of Ryu’s first captured Dragon Pokémon. He uses its Dig attack to easily travel through caves. It is a powerful battler that uses a combination of brute force and strategy. Not much is currently known about Druddigon. Ryu attempted to use its brute strength in order to gain an advantage over Galileo’s Dracosmic. Fraxure has yet to show its full potential, and not yet been seen enough to determine anything about it. Ryu called Noivern his “secret weapon,” inferring it had great power. It showed high levels of speed and power, but wasn’t able to make it far against Galileo’s Dracosmic. Ryu caught this Pokémon at about the same time Ash caught Heala. It has a prideful personality, which can lead it into trouble. It refuses to dodge attacks, preferring to stand its ground, so Ryu developed a special strategy for it so it doesn’t have to. Will is a Pokémon Coordinator. Despite the fact that he’s fairly new, having only recently received his first ribbon, his constant training and studying of the art of a Pokémon Contest has lead him to be one of the most talented coordinators currently in the Tenno circuit. He almost always remains calm and collected. He is considered very handsome, and due to that and his talent, he is popular with the ladies. Ravenoir seems to be Will’s signature Pokémon. He often keeps it out of its Pokéball, allowing it to perch on his shoulders. It is an elegant yet powerful battler, and can put on a great show during a contest. Cryogonal was the first Pokémon Brenda saw Will use. It can precisely control its attacks, while also making them look extremely beautiful. As it has yet to be seen in a battle, it’s full power is unknown. Will caught this Pokémon and then immediately began to train it for his next contest. At first, despite its training, it still had some wild tendencies. When Will’s Cryogonal accidentally froze it, it got extremely angry and ran off. Duosion was seen for only a short amount of time during the Starcore Contest, where it was paired up with Will’s Cryogonal. He later used it again when partnered with Brenda at the Horizoport Contest, where it showed a high degree of control over both its attacks and movements. Will was first seen using this Pokémon for his battle with May in the Wallace Cup. Due to its natural abilties, it has an aresonal of moves to burn and poison the opponent with. It is able to precisely control its movements. Obtained Prior to: Cup, Up, and Away! Famous superhero and self-proclaimed protector of Tenno, the Guardian is a ninja-themed vigilante who uses his expert skills both as a martial artists and a Pokémon trainer to protect truth, justice, and the Tenno way. His arch-nemesis is the samurai-esque villain known as Bushido. As one might expect from a ninja-themed hero, his entire team is ninja-themed. He uses his Pokémon both for battles and more practical applications. The Guardian’s faithful companion and sidekick. As one can expect of a ninja, it is highly trained in the art of stealth, trickery, and sabotage. It is an extremely powerful Pokémon and has been thoroughly trained in the ninja arts. Another one of the Guardian’s cadre of ninja Pokémon. It’s extreme athleticism combined with unique usages of its tongue makes it a formidable force. It serves as the Guardian’s primary long-range attacker. The Guardian used Scizor to have it clear away a field of spikes with its Razor Wind. While it has yet to be seen in battle, it can be assumed to follow the standard technique of the Guardian’s other ninja Pokémon, prioritizing speed and strategy over all else. Like others of its species, the Guardian’s Lucario is highly adept in sensing Aura. Combined with its ninja techniques, it must certainly be a formidable Pokémon. Nothing is yet known about the Guardian’s Accelgor except for the fact that its ability to spit acid makes it perfect for breaking into locked facilities. It certainly has many other uses as well. The newest member of The Guardian’s team. It specializes in landing rapid, yet powerful and decisive moves. The Guardian used it to exploits the weakness of Bushido’s Golisopod. Brenda’s childhood friend from Launch Town. Coincidentally she also decided to become a coordinator. She lacks the natural talent that Brenda possess, but makes up for it with intense training. She has a crush on Will. Both Brenda and Michelle befriended Poliwrath at a lake near Launch Town when it was a Poliwag. When Michelle left on her journey, she decided to take the Poliwag with her as her partner. It late evolved into Poliwhirl, and then Poliwrath. Darumaka is a playful and energetic Pokémon acquired by Michelle during her journey. This Pokémon was only seen briefly during Michelle’s tag appeal with Damien, so little is known about it. Michelle first used this Pokémon in her battle against Brenda at Professor Pine’s Astro Camp as an Eevee. At the time, she and it seem to be working especially on the move Swift in order to get it to evolve into Radeon. Braydon left on his journey to become the Tenno Region Champion at the same time as his greatest rival, Brandon. He is extremely competitive, turning nearly anything into a competition. He also seems to have a flare for drama. He may have lost to Brandon in the Tenno League, but Ash inspired him to have another go at it. This was Braydon’s first Pokémon. He recieved it as a Kappaqua from Professor Pine at the same time Brandon got his Turcell. It has mastered its ability to telekinetically control water, and this makes it a powerful opponent against any other Water-Type. Brandon is a trainer from Launch Town. After receiving Turcell, his first Pokémon, he quickly went on to gather eight Gym Badges from across Tenno and enter the Tenno League. He not only made it to the finals, but won, and became the first trainer from Launch Town to ever win a Pokémon League. He is an extremely powerful and skilled battler and is currently training to challenge the Champion League and attempt to become the Tenno Champion. While he has all of this strength and ability, he does not think he deserves it, rather he thinks he just got lucky. He is also one of the few people who knows the true face of Team Planetary, and has made it his mission to stop them. Brandon received a Turcell as his first Pokémon. Over the course of his journey, that Turcell evolved, eventually becoming a Solurtle. The pair are very close, and have mastered the art of Mega Evolution, allowing Solurtle to become Mega Solurtle. As Mega Solurtle, its power increases tremendously. Due to this, Brandon only has it Mega Evolve in the toughest of battles. This Pokémon was used by Brandon in an effort to fight off a sneak attack by Team Interplanetary. It’s mystical powers allow it access to a wide range of attacks. It was later used to stop Team Interplanetary from escaping by using its Shadow Bind move. Brandon used this Pokémon to transport himself to Opti City. It has yet to be seen in combat. When Brandon needed a defensive Pokémon to back-up his Solurtle, he called upon Eayai. Like others of its species, Eatyai has the ability to alter memories. Chris is a brand new trainer from Launch Town. He knew of Brandon, but Brandon doesn’t seem to remember him well. He’s an eager trainer who overestimates his own skill. He also has a lot of energy, and will run into almost any challenge. He sees Brandon as a roll-model, and wants to be just like him. Sporout was Chris’ first Pokémon. Apparently he was supposed to get it soon after Brenda got her Kappaqua, but due to Cosmo stealing Professor Pine’s only Sporout, he had to wait. Sporout is a fairly clueless Pokémon. It does what it is told, and often has energy to match Chris’. This is the Anime serie right? Yeah, these are the characters from my story, which is based off the anime. Ash is my fav protagonist from Pokémon franchise and all animes, see a fanfic with Ash as main character will be awesome! I have read 3 episodes, the fanfic is awesome, when I’m less busy I will read all the other episodes. Sorry, but I’m not going to have Max in as a main character. There is a possibility that he might come in the form of a cameo at a later time, but don’t hold me to that. How many episodes of Pokemon Cosmic Quest will be complete until the way through to the end of Ash, Brenda and Brock? Sorry, but you’re wording is making it very hard for me to understand your questions. Are you asking how many episodes until the end of Cosmic Quest? If so, I have no definite answer. I make episodes as I go and have no set schedule beyond a basic plot. How many episodes that plot takes is unknown until its over. However, Ash has just received his fifth gym badge out of eight, and then after the eight, there’s the Pokémon League, so using that as a measurement, we’re about half-way through, so there’s approximately 70 episodes left, but that’s not a set number by any means. What happened when Pokemon Cosmic Quest make that funny moment if I’m going to be laugh so hard that goes to Ash and friends even Team Rocket right here in the Tenno region. Hey. I think I know what’s gonna happened to the Pokemon Cosmic Quest it would be make it funny moment that goes to Ash and friends even Team Rocket as well right here in the Tenno region. Pokemon Cosmic Quest episode was called Pikachu Where Are You based on for Scooby Doo Where Are You from Cartoon Network. Pokemon Cosmic Quest funny moments that something is going to happened to Ash and friends at this time with Team Rocket when I was laughing so hard right here in the Tenno region. Why is Ash wearing the Pokemon Cosmic Quest outfit clothes when he goes to the Tenno region? To answer both this question, and the one about Brock, both Ash and Brock are given new clothes whenever they go to new regions. Tenno is no different. Okay. Now that’s a good answer. Why is Brock wearing the Pokemon Cosmic Quest outfit clothes when he goes to the Tenno region? Is Michelle’s Eevee going to evolve into a new light type Pokemon? Here’s the thing, I don’t want to give spoilers to my story. If something hasn’t happened or hasn’t been revealed yet, I’m not going to tell you what’s going to happen. So I’ll just give the same answer I’ve given to your other questions of the sort, you’ll have to wait and see. Okay. I’ll have to wait to see what is it. When will Ash will win the Pokemon league and Brenda will win grand festival right here in the Tenno region? I literally just told you that I’m not giving spoilers. Okay. I guess not. I’ll wait to see what is it. Pokemon Cosmic Quest May has changed into a new outfit of Pokemon Omega Ruby and Alpha Sapphire even Tate and Liza the gym leaders of the Mossdeep City from the Hoenn region returns as well right here in the Tenno region. Pokemon Cosmic Quest episode are Ash and Brenda falling in love make it shipping right here in the Tenno region? Ash and Brenda will have no more of a relationship than Ash had with May or Dawn. For the record, I am not a supporter of shipping. The question is why are Team Rocket not going to be absence in the episode of Pokemon Cosmic Quest? This is the only one thing that goes to Pokemon Best Wishes, Pokemon XY The Series and Pokemon Sun and Moon The Series? Are you asking why Team Rocket is in every episode of Cosmic Quest? The answer is that they were essentially in every single episode from their introduction up until the end of Sinnoh, so I try to replicate that. Also, they are my favorite characters in the show, so I believe they deserve to show up at least once in every episode. I am very annoyed right now with how often they don’t show up in Sun and Moon. Okay. Now that’s a good answer. Then how come there are no more seeing Ash’s previous friends from Pokemon Best Wishes and Pokemon XY The Series? If you’re referring to the fact that characters like Tracey, May, and Dawn have returned for a few episodes while characters like Cilan and Clemont haven’t, all I can tell you is that Cosmic Quest still has a long way to go until it’s over, so many things that have yet to happen still can happen in the future. What about Paul, Trip and Alain? Are they gonna be here on Pokemon Cosmic Quest episode? Hey. Is James’ Mime Jr. going to evolve into Mr. Mime by learning to use Mimic? Normally this is a time where I would tell you that I don’t give any spoilers, but you should know that James’ Mime Jr. already knows Mimic, and I would never evolve Mime Jr., as that would ruin its dynamic with James. Hey. Did May wear her new Pokemon Omega Ruby and Alpha Sapphire outfit clothes? That was a totally amazing. I’m really like that one in this episode of Pokemon Cosmic Quest until her Wartortle evolved. Yes, May was wearing her clothes from Omega Ruby and Alpha Sapphire.